Jean Mary Palmer (nee Locatelli), beloved wife of the late Dr. Clifford A. Palmer passed away peacefully on November 30, 2018 at the Chinook Regional Hospital with her family by her side. Jean is survived by her loving daughters, Dianne of Lethbridge, and Donna of Kelowna, B.C. Jean was a devoted grandmother to grandsons, Samuel Palmer of Edmonton and Maxfield Palmer of Vancouver. She is predeceased by her parents, sister Antoinette (Nettie Fabbi), and brothers Carl and Pio Locatelli. 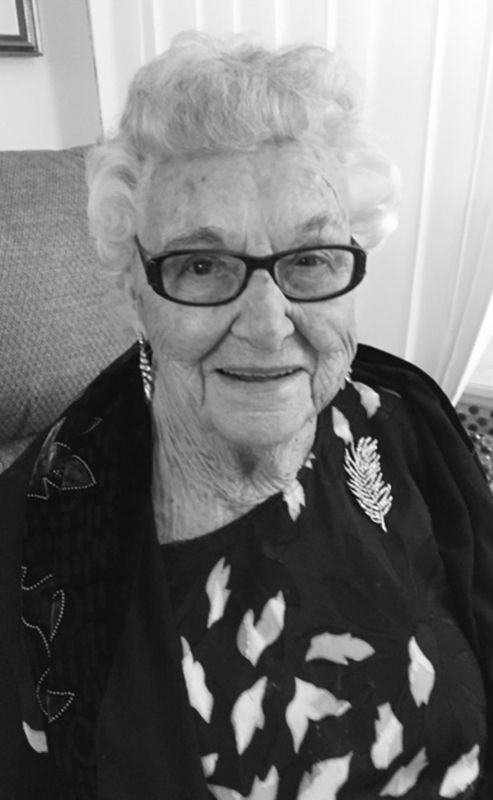 Jean was born in Taber, Alberta and spent her young life in Coalhurst, Alberta. She entered the Galt School of Nursing program in Lethbridge and graduated with her RN in 1944. Many of the doctors and nurses who cared for Jean on 5A and 4B, visited the atrium at the Chinook Regional hospital to see her graduating class photo, class of 1944 (J. Locatelli). Jean, then met and married the man of her dreams, a local optometrist, Dr. Clifford Palmer and they made beautiful music together for 56 years. Cliff passed away March 26, 2002. Jean’s later years were spent at the “View” in Lethbridge where she enjoyed her new and old friends, the wonderful staff, and many activities! Jean was well known there by her fellow residents, staff and caregivers for her laughter, her kindness and her witty charm! Special thanks to Jean’s family doctor, Dr. Tupper. Also special thanks to the wonderful doctors who cared for her in hospital – Dr. Malpica, Dr. Oviatt, and Dr. Latchmea. Also thanks to all the nurses on 4B for the exceptional care and kindness that you showed Jean during her final days. Many thanks also to those at the “View” who helped make her “golden years” so special. We are grateful to Russ, Urszula, Richard, Denise, Wilco, Linda, Wendy, Sri, Briana, Arlene and so many other wonderful staff members. Also special thanks to her devoted caregivers – Kathy, Colleen, Jen, Louise, Amy, to only name a few. Special mention to her many friends at the “View” – Henrietta, Ruth, Betty Jean, Glenda, Mary Ellen, John and Marilyn, Tony, Irene, Ron and his family and so many others who were very important to her. Thanks also to her dear friends, Ria and Dennis Brady, Cindy Neumann and her family, Win Evans, great niece Tracy Faulkner and nephew Ken Fabbi. Thank you all for your love and support! So sorry for your loss . Your mother was so full of life! I had the honour of meeting her through my step Dad Ron Fraileigh Visiting at the View. She was so very kind ,always had a smile and kind words . She was a very special friend to my Dad. They both shared the loss of their partners .I feel Her friend ship helped my Dad through a very sad and difficult time . My visits to the View just won’t be the same without her smiles and humorous stories .She will be dearly missed by everyone who had the pleasure of meeting her.